IL-12 is a central cytokine in the activation of inflammation and immunity and in the generation of Th1-type responses. Tumor-associated macrophages (TAM) from mouse and human tumors showed defective production of IL-12. 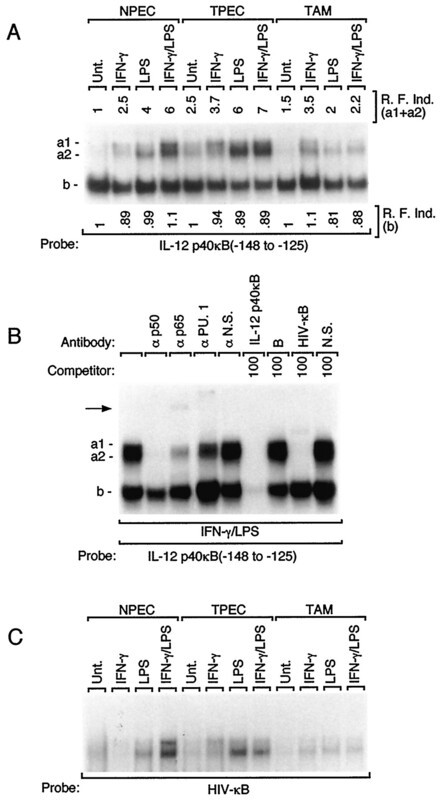 Defective IL-12 production was associated with lack of p50/p65 NF-κB activation. TAM produced increased amounts of the immunosuppressive cytokine IL-10. Abs against IL-10 restored the defective capacity of TAM to produce IL-12. Our data suggest that during tumor growth an IL-10-dependent pathway of diversion of macrophage function can be activated into the tumor microenvironment and results in the promotion of the IL-10+ IL-12− phenotype of TAM. Blocking IL-10, as well as other immunosuppressive cytokines present in the tumor microenvironment, such as TGF-β, may complement therapeutic strategies aimed at activating type I antitumor immune responses. The cytokine repertoire at the tumor site is a determinant for successful immune responses against tumors. In this view, immunosuppressive cytokines produced by tumors may target and paralyze immunocompetent cells and represent a major obstacle in cancer therapy of tumor-bearing hosts. Macrophages have the capacity to produce a high amount of cytokines and may provide an important contribution to establish the cytokine profile in the tumor microenvironment. These cells represent a major component of the lymphoreticular infiltrate of tumors, whose recruitment into neoplastic tissues is governed by tumor-derived chemotactic factors (1, 2, 3, 4, 5, 6). Tumor-associated macrophages (TAM)3 have an ambivalent role in the regulation of tumor growth and metastasis (1, 2, 7, 8). Although fully activated macrophages can mediate destruction of tumor cells or tissues, in many tumors TAM promote tumor growth and dissemination (1, 2). Alterations in the function of TAM have been described, including the defective production of reactive oxygen and nitrogen intermediates and tumor cytotoxicity (1, 9, 10, 11), and the capacity to suppress specific immunity (12). The molecular basis responsible for the functional phenotype of TAM has not been defined. Macrophages produce high amounts of IL-12, a proinflammatory and immunoregulatory heterodimeric cytokine composed of two covalently linked glycosylated chains of ∼40 (p40) and 35 (p35) kDa (13). IL-12 production by macrophages is induced upon cell activation with a variety of stimuli, including a combination of IFN-γ and LPS (13). In addition to promoting cytokine production, proliferation, and cytotoxic activity in NK and T cells, IL-12 plays an essential role in driving differentiation of uncommitted cells toward a type I CD4+ T helper phenotype (Th1) and contributes to optimal IFN-γ production, thus being critical for promotion of cell-mediated immunity (13). Due to its biological properties, IL-12 represents an attractive agent for anticancer therapy (13), and lack of its production may be a serious impairment for effective antitumor responses. In this study, we report that TAM have a drastically defective capacity to produce IL-12 and define the alterations in transcription factors and cytokine production which underlie this protumor phenotype. Defective IL-12 expression is due to autocrine production of IL-10 and is paralleled by lack of NF-κB activation. Commitment of macrophages to high production of immunosuppressive cytokines may represent a powerful strategy used by tumors to escape immune surveillance. Peritoneal elicited macrophages (PEC) and TAM were incubated in RPMI 1640 medium containing 10% FCS, 2 mM glutamine, and 100 U/ml penicillin-streptomycin. For the different treatments (stated in the text), we used the following concentrations: IFN-γ, 100 U/ml and LPS, 100 ng/ml. Male 8-wk-old C57 black mice were obtained from Charles River Breeding Laboratories (Calco, Italy). Mice were inoculated intramuscularly in the left hind limb with a total of 105 tumor cells. Tumor take was monitored and diameters of growing tumors were measured in centimeters twice a week by caliper. PEC and TAM were obtained 3 wk after tumor cell injection. TAM were isolated as described previously (14): briefly, solid tumors were disaggregated by exposure to 0.3% collagenase (Sigma, St. Louis, MO) for 40 min at 37°C; 150 × 106 cells in 20 ml of RPMI 1640 were seeded in 140-mm petri dishes (Cel Cult; Sterilin, Feltham, U.K.), and, after 2 h of incubation, nonadherent cells were vigorously washed. Adherent cells were >95% macrophages as assessed by morphologic and functional criteria. Contaminating cells were tumor cells, unidentified small mononuclear cells, and polymorphonuclear leukocytes. All culture reagents contained less than 0.125 endotoxin unit/ml as checked by Limulus amebocyte lysate assay (BioWhittaker, Walkersville, MD). Peritoneal exudate cells were obtained from mice injected 4 days previously with 1 ml of 3% thyoglicollate medium (Difco, Detroit, MI) as described previously (14). A total of 60 × 106 macrophages was seeded in 20 ml of RPMI 1640 (BioWhittaker) supplemented with 2 mM glutamine (Seromed, Munich, Germany) and 20 mM HEPES (Merck, Darmstadt, Germany) in 140-mm petri dishes (Cel Cult; Sterilin), and, after 1 h of incubation, nonadherent cells were thoroughly washed off with jets of medium. Monolayers were >95% macrophages as assessed by morphologic and functional criteria. Murine recombinant IFN-γ was kindly donated by Dr. G. Garotta (Hoffmann-LaRoche, Basilea, Switzerland). LPS (Escherichia coli 055:B5) was purchased from Difco. Rat Abs to mouse IL-10 SXC.1 (15), HB10739, and rat Abs to mouse IL-10 JES5-2A5.11 (16), HB10958, were purchased from American Type Culture Collection (Manassas, VA). Determination of murine IL-12 and murine IL-10 supernatants was conducted by using ELISA kits purchased from Benfer-Sheller, Keystone Laboratories (Milan, Italy). Cells were cultured in medium alone or supplemented with the indicated agents, and total RNA was purified as described (17). Ten micrograms of total RNA from each sample was electrophoresed under denaturing conditions, blotted onto Nytran membranes (Schleicher & Schuell, Keene, NH), and cross-linked by UV irradiation. Membranes were prehybridized at 42°C in Hybrisol (Oncor, Gaithersburg, MD) and hybridized overnight with 1 × 106cpm/ml of 32P-labeled probe. Membranes were then washed three times at room temperature for 10 min in 0.2× SSC [1× SSC: 0.15 M NaCl, and 0.015 M sodium citrate (pH 7.0)], 0.1% SDS, and twice at 60°C for 20 min in 0.2× SSC and 0.1% SDS before being autoradiographed using Kodak XAR-5 films (Eastman, Rochester, NY) and intensifier screens at −80°C. cDNAs were labeled by random priming using a commercial kit (Boehringer Mannheim, Indianapolis, IN) and [α-32P]deoxycytidine 5′-triphosphate (3000 Ci/mmol; Amersham, Arlington Heights, IL). For EMSA nuclear proteins were prepared as follows: the cellular pellet was resuspended in 10–20 times its volume in buffer A (lysis buffer): 50 mM KCl, 0.5% Nonidet P-40, 25 mM HEPES (pH 7.8), 1 mM PMSF, 10 μg/ml leupeptin, 20 μg/ml aprotinin, and 100 μM DTT and subsequently incubated for 5 min in ice. Cells were collected by centrifugation at 2000 rpm, and the supernatant was decanted. The nuclei were washed in buffer A without Nonidet P-40, collected at 2000 rpm, and resuspended 5 min in buffer B (extraction buffer): 500 mM KCl, 25 mM HEPES (pH 7.8), 10% glycerol, 1 mM PMSF, 10 μg/ml leupeptin, 20 μg/ml aprotinin, and 100 μM DTT for 5 min in ice. The samples were subsequently frozen and thawed (twice) by dry ice and a 37°C water bath, rotated 20 min at 4°C, and centrifuged at 14,000 rpm for 20 min. The clear supernatant was collected and the proteins were dialyzed for 4 h against buffer C (dialysis buffer): 50 mM KCl, 25 mM HEPES (pH 7.8), 10% glycerol, 1 mM PMSF, 10 μg/ml leupeptin, 20 μg/ml aprotinin, and 100 μM DTT. The nuclear proteins were incubated with radiolabeled DNA probes in a 20-μl reaction mixture containing 20 mM Tris (pH 7.5), 60 mM KCl, 2 mM EDTA, 0.5 mM DTT, 1 μg of poly(dI-dC), and 4% Ficoll. Nucleoprotein complexes were resolved by electrophoresis on 5% nondenaturing polyacrylamide gels in 0.5× Tris-borate-EDTA buffer at 12 V/cm for 2 h at room temperature. Dried gels were exposed to Kodak XAR-5 film (Eastman) at −70°C with intensifying screens. Oligonucleotides were purchased from Life Technologies (Milan, Italy) and were end labeled using Klenow enzyme and [α-32P]deoxycytidine 5′-triphosphate; ∼1 ng of labeled DNA was used in a standard EMSA reaction. The following antisera were used in supershift analysis: 1157, raised against the Rel homology domain containing residues 339–357of human p50 and also recognizing the murine p50 (18); 1226, raised against a peptide containing the C-terminal 14 residues of human and murine p65 (18); anti-PU.1 (SC-352X) was purchased from Santa Cruz Biotechnology (Santa Cruz, CA). Double-strand oligonucleotide sequences used in EMSA are also reported here: 5′- GGAGGGAGGAACTTCTTAAAATT-3′ region A IL-12 p40 (nt −148 to −125); 3′-CTCCCTCCTTGAAGAATTTTAAG-5′; 5′-GTTCCCCCAGAATGTTTT-3′ region B IL-12 p40 (nt −125 to −110); 3′- AAGGGGGTCTTACAAAAG-5′; 5′- GATCCAGAGGGGACTTTCCGAGAGGC-3′ HIV-1 κB; and 3′- GTCTCCCCTGAAAGGCTCTCCGCTAG-5′. Densitometric analysis was performed with a scanning densitometer GS300 (Hoefer Scientific Instruments, San Francisco, CA). We implanted s.c. the 3-methylcolanthrene (MCA)-derived fibrosarcoma MN/MCA-1 in C57B1/6 mice (1). Three weeks after tumor implant, TAM and PEC were obtained as described (14) and cultured for 18 h in the presence or absence of IFN-γ (100 U/ml) and LPS (100 ng/ml). Supernatants were collected and assayed by ELISA for IL-12 production. As shown in Fig. 1⇓A, supernatants from normal PEC (NPEC) and PEC from tumor-bearing mice (TPEC) contained high levels of IL-12 (∼400 pg/ml). In contrast, IL-12 protein levels were almost undetectable in supernatants from TAM. Defective IL-12 expression in TAM. A, After isolation of TAM, NPEC and TPEC, cells were incubated for 18 h as indicated, and supernatants were collected and assayed by ELISA to evaluate IL-12 protein levels. Samples were determined in triplicate and values are the average (±SD) of three separate experiments. B, Analysis of the levels of expression of IL-12 p40 mRNA. C, Analysis of the levels of expression of IL-12 p35 mRNA. Data in A–C are representative of three different experiments. Ten micrograms of total RNA was used in Northern blot. In each experiment, TAM, TPEC, and NPEC were obtained from 15 tumor-bearing mice and from 15 control mice, respectively. R. F. ind., relative fold induction. Values were normalized for the levels of mRNA expression observed in LPS-stimulated NPEC, to which a value of 1.0 was assigned. To investigate the mechanisms underlying the lack of IL-12 secretion by TAM, the levels of IL-12 p40 and p35 mRNA expression was evaluated by Northern blot analysis. Although the levels of IL-12 p40 mRNA expression (Fig. 1⇑B) were strongly induced in NPEC upon cotreatment with IFN-γ (100 U/ml) and LPS (100 ng/ml) for 4 h, its expression was slightly lower in TPEC and virtually absent in TAM. Similar results were obtained when the IL-12 p35 mRNA levels were analyzed (Fig. 1⇑C). Transcriptional mechanisms leading to activation of the murine IL-12 p40 promoter have been studied (19). The NF-κB half site located in the proximal IL-12 p40 promoter region (nt −148 to −125) was described to functionally interact with NF-κB proteins and identified as an essential regulatory element for transcriptional activity of this promoter gene. To investigate the molecular mechanisms responsible for the suppression of IL-12 expression, we performed EMSA studies by using nuclear extracts from TAM and PEC from both normal and tumor-bearing mice in the presence of a 32P-labeled oligonucleotide (nt −148 to −125) containing the IL-12p40 NF-κB half site (Fig. 2⇓A). In resting cells, similar levels of a predominant DNA/protein complex b were observed in the presence of nuclear extracts from NPEC, TPEC, or TAM. Noteworthy, upon IFN-γ/LPS cell activation, while formation of complex b did not undergo significant variations, two inducible DNA/protein complexes (a1 and a2) were expressed at much higher levels in nuclear extracts from NPEC and TPEC in comparison to TAM. To identify the protein components of complexes a1 and a2, competition studies and supershift analysis were performed (Fig. 2⇓B) in the presence of nuclear extracts from NPEC. Although cold competition with specific (Fig. 2⇓B, lane 6) and nonspecific (Fig. 2⇓B, B and NS, lanes 7 and 9) cold oligonucleotides verified the specificity of this DNA/protein interaction, a cold oligonucleotide containing the NF-κB binding site of the HIV-long terminal repeat (20) (Fig. 2⇓B, lane 8) was able to compete complex a1 and a2 formation, suggesting the presence of NF-κB members within these complexes. Supershift analysis with antisera against the p50 (Fig. 2⇓B, lane 2) and p65 (Fig. 2⇓B, lane 3) NF-κB proteins identified p50 as a component of complex a2 and the p50/p65 NF-κB heterodimer as components of complex a1. The fact that anti-p50 Ab (antiserum1157) did not supershift but rather competed the DNA/protein complex formation of complexes a1 and a2 is due to the nature of this Ab which was raised against the binding domain region of the p50 protein (18), thus preventing its binding activity. A similar DNA-binding pattern was obtained by using a 32P-labeled HIV-κB oligonucleotide as probe (Fig. 2⇓C), suggesting that lack of interaction of NF-κB proteins with the IL-12 p40 NF-κB site is not selective for this DNA element, but is likely due to lack of expression of nuclear NF-κB. Thus, the identification of alteration in the molecular mechanisms leading to NF-κB activation may be important for the defective expression of a number of NF-κB-dependent genes involved in inflammation and immunity, in addition to IL-12 (21). Lack of IL-12 NF-κB-binding activity in TAM. A, EMSA using nuclear extracts from TAM, NPEC, or TPEC treated as indicated for 4 h was performed by using the 32P-labeled oligonucleotide containing the IL-12 p40κB regulatory region of the IL-12 p40 promoter (nt −148 to −125). Data in A is representative of two different experiments. R. F. ind., relative fold induction. Values were normalized for the DNA-binding activity observed in untreated NPEC, to which a value of 1.0 was assigned. B, Competition and supershift analysis of the IL-12 p40κB DNA/protein complex. Anti-p50, antiserum 1157; anti-p65, antiserum 1226; anti-PU.1; N. S., nonspecific Ab. IL-12 p40κB, 100 ng of cold oligonucleotide containing the IL-12 p40 promoter region nt −148 to −125. B, A total of 100 ng of cold oligonucleotide containing the IL-12 p40 promoter region nt −127 to −110. HIV-κB, 100 ng of cold HIV-κB oligonucleotide; N. S., 100 ng of cold nonspecific oligonucleotide. Nuclear extracts were obtained from NPEC. C, Binding of nuclear extracts from TAM, NPEC, and TPEC treated as indicated for the 32P-labeled HIV-κB oligonucleotide. TAM, TPEC, and NPEC were obtained from 15 tumor-bearing mice and 15 control mice, respectively. IL-10 strongly inhibits IL-12 production by human and murine monocytes/macrophages in response to activation by LPS (22). We have therefore evaluated the IL-10 protein and mRNA expression in TAM and PEC (Fig. 3⇓). 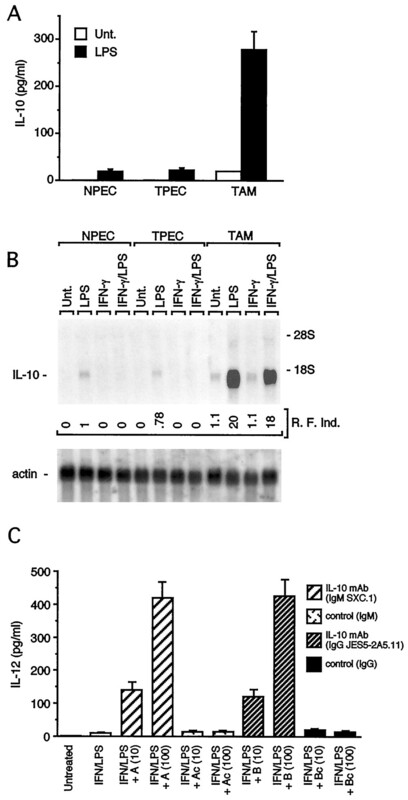 Unlike NPEC and TPEC, unstimulated TAM expressed appreciable levels of IL-10 protein (Fig. 3⇓A) and mRNA (Fig. 3⇓B) comparable to those found in LPS-stimulated PEC. LPS-induced IL-10 expression and production (300 pg/ml) in TAM was much greater (≃12-fold) than in PEC. Interestingly, although IFN-γ (100 U/ml) inhibited the LPS-induced IL-10 mRNA expression in PEC, TAM were insensitive to this pathway of negative regulation (Fig. 3⇓B). Because IL-10 inhibits NF-κB activation and IL-12 production (13, 23), it was important to address whether IL-10 production and defective IL-12 induction were causally related in TAM. As shown in Fig. 3⇓C, two blocking anti-IL-10 mAbs completely restored the capacity of TAM to produce IL-12 to levels similar to those of control cells. Role of autocrine IL-10 in TAM. A–C, Overexpression of IL-10 in TAM. A, Supernatants from TAM and PEC, stimulated for 18 h as indicated, were analyzed by ELISA for IL-10 protein expression. Samples were determined in triplicate and values are the average (±SD) of three separate experiments. B, A total of 10 μg of total RNAs from TAM, NPEC, and TPEC treated as indicated for 4 h was analyzed by Northern blot for IL-10 mRNA expression. Data in A–C are representative of three different experiments. R. F. ind., relative fold induction. Values were normalized for the levels of mRNA expression observed in LPS-stimulated NPEC, to which a value of 1.0 was assigned. C, Reversion of IL-12-defective secretion by anti-IL-10 mAbs. Purified TAM were activated with IFN-γ/LPS in the presence of increasing concentrations (10 μg/ml and 100 μg/ml) of different anti-IL-10 mAbs (A and B) as indicated, or in the presence of the respective control Abs (Ac and Bc). After 18 h, supernatants were collected and the concentration of IL-12 protein was analyzed by ELISA. TAM, TPEC, and NPEC used in each experiment were obtained from 15 tumor-bearing mice and 15 control mice, respectively. To define whether suppression of IL-12 production by autocrine IL-10 represents a common immunosuppressive event targeting macrophages associated with tumors, total RNA was obtained from TAM isolated from the Moloney sarcoma virus-derived MS2, the benzo(a)pyrene-induced mFS6 sarcoma, its derived M4 subline (24) and the B16 melanoma (25). As shown in Fig. 4⇓A, similar to the MN/MCA1 fibrosarcoma, TAM associated from the MS2, mFS6, and M4 tumors were committed to high production of IL-10 and lack of IL-12 p40 mRNAs expression. In partial contrast, TAM associated with the B16 melanoma did not express either IL-12 or IL-10, whereas TPEC B16 expressed lower levels of IL-12 mRNA and significant levels of IL-10 mRNA. Of interest, in contrast with sarcoma cells, B16 melanoma cells secreted high amounts of IL-10 (data not shown), suggesting that melanoma-derived IL-10 may be responsible for defective activation of macrophages associated with this tumor. Next, to ascertain the possible relevance of this mechanism in human tumors, TAM were isolated from solid tissue of human ovarian carcinoma (e.g., see Refs. 1 and 6). Cells were cultured in vitro for 24 h, and the supernatants were tested for IL-12 and IL-10. Results show (Fig. 4⇓B), in three separate experiments, IL-12 levels in supernatants from resting and stimulated TAM were very low (undetectable and 5 ± 3 pg/ml, respectively). In contrast, TAM constitutively secreted high amounts of IL-10 (37 ± 9 pg/ml) further increased upon activation (95 ± 15 pg/ml). In contrast, activated human monocytes secreted high levels of IL-12 (132 ± 35 pg/ml) and low levels of IL-10 (36 ± 8 pg/ml). A, Expression of IL-12 and IL-10 mRNAs in TAM from different murine tumors. 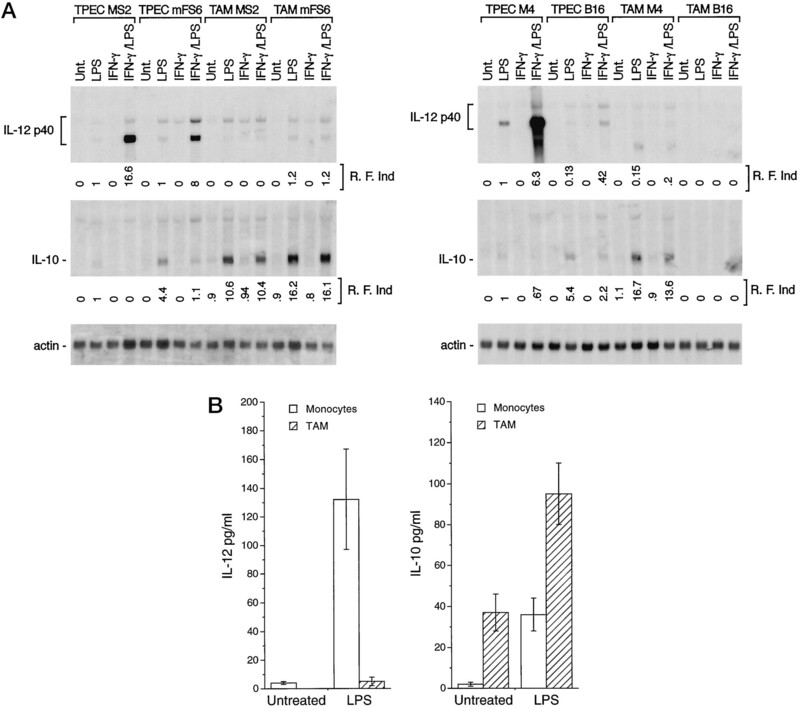 Ten micrograms of total RNAs from TAM and TPEC treated as indicated for 4 h was analyzed by Northern blot for IL-12 p40 and IL-10 mRNA expression. In each group, 10 mice were injected with the following tumors, as indicated: Moloney sarcoma virus-derived MS2, the benzo(a)pyrene-induced mFS6 sarcoma, and its derived M4 subline, the B16 melanoma. R. F. ind., relative fold induction. Values were normalized for the levels of mRNA expression observed in LPS-stimulated TPEC MS2 (left) or LPS-stimulated TPEC M4 (right), to which a value of 1.0 was assigned. 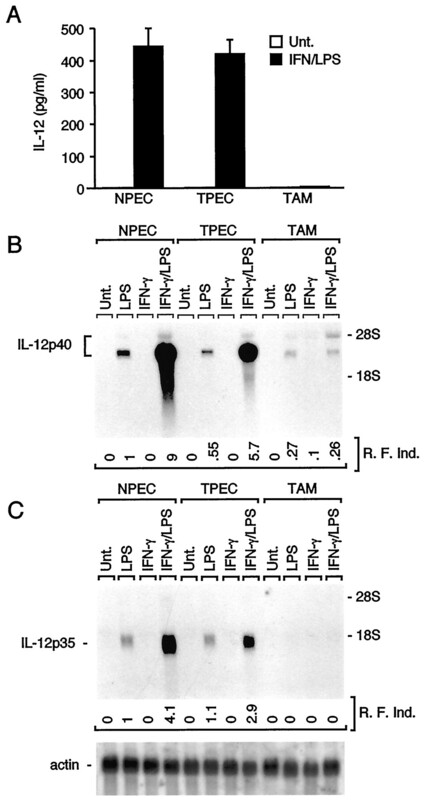 B, Defective IL-12 production and high secretion of IL-10 in TAM from human ovarian carcinoma. IL-12 and IL-10 proteins were determined by ELISA. Three different experiments are considered and results are expressed as pg/ml ± SD. The results presented here show that autocrine production of IL-10 is a major determinant of the inhibited production of IL-12 by TAM (13, 23). The actual relevance of this inhibitory circuit was confirmed in a variety of mouse tumors and, more importantly, in human ovarian carcinoma. TAM isolated from these tumors consistently expressed appreciable levels of IL-10 and almost undetectable levels of IL-12. This observation strongly supports the idea that commitments of macrophages to high production of IL-10 may be a common mechanism used by tumors to interfere with immune responses and promote tumor survival. IL-10, which was first identified as a factor produced by Th2 cells, inhibits cytokine production by Th1 cells (26) and contributes to the inhibition of accessory function of macrophages and dendritic cells (27). Along with TGF-β, IL-10 is spontaneously produced by a variety of tumors and is believed to play a major role in the induction of immunosuppression during tumor growth (28). IL-10-immunosuppressive activities may be at least in part ascribed to its capability to inhibit NF-κB activity (23). NF-κB plays a central role in the control of inflammation and immunity (21) and represents an ideal target for tumors to disrupt immune responses. In our experiments, suppression of the NF-κB-dependent IL-12 p40 gene expression (19) correlated with lack of NF-κB-binding activity in nuclear extracts from TAM, whereas two different anti-IL-10 mAbs fully restored IL-12 production. This molecular pathway most likely underlies other alterations of TAM functions dependent on NF-κB activation, such as defective inducible NO synthase activation (9, 21), and represents a severe impairment for inflammatory and immune responses. In support of this, IL-10 knockout mice demonstrated prolonged survival and increased capacity to reject tumors as compared with control mice (29). Our data suggest that during tumor growth, an IL-10-dependent pathway of diversion of macrophage function can be activated into the tumor microenvironment. Although it remains to be determined which tumor-dependent signals are involved in promoting the IL-10+ IL-12− phenotype of TAM, blocking IL-10, as well as other immunosuppressive cytokines present in the tumor microenvironment, such as TGF-β, may complement therapeutic strategies aimed at activating type I antitumor immune responses. We thank Dr. N. Rice (Advanced Bioscience Laboratories-Basic Research Program-National Cancer Institute, Frederick, MD) for the gift of p50 and p65 antisera, Dr. G. Trinchieri (Winstar Institute of Anatomy and Biology, Philadelphia, PA) for the donation of the IL-12p40 and IL-12p35 cDNA probes, and Dr. G. Garotta (Hoffmann-LaRoche) for the donation of murine recombinant IFN-γ. ↵1 This work was supported by the Associazione Italiana Ricerca sul Cancro, Istituto Superiore di Sanità, Italy-United States of America Project on Therapy of Tumors, and Ministero Università Ricerca Scientifica e Tecnologica Rome (Italy). ↵3 Abbreviations used in this paper: TAM, tumor-associated macrophages; PEC, peritoneal-elicited macrophages; MCA, 3-methylcolanthrene; NPEC, normal PEC; TPEC, tumor-bearing PEC.